The Riverbend Coffee Table is the perfect addition to your contemporary styled living room. This piece features unique distressing, a simple square shape and double drawers for additional storage. Antique Brass Drawer handles create interest in the piece as well. 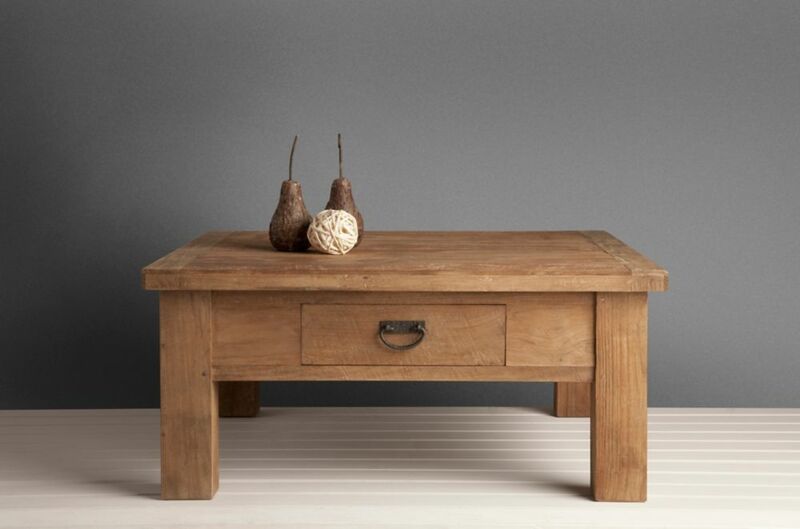 Inspired by the simplicity of craftsman style furniture, each piece is handmade and naturally finished. The organic composition of this coffee table truly has a chance to shine, through the intentional use of distressing that exposes the delicate fine grain of its solid mango wood construction. Crafted by hand making each one a one-of-a-kind work of art, this environmentally conscious table will bring a combination of rustic charm and earthy beauty to the home. Allowing for easy transition between use as a table or ottoman in the living room, bedroom, or seating area, the large surface area of this piece will allow for an abundance of space to style dicor. This beautiful and sturdy coffee table will complement your home dicor while adding functionality with its extra bottom shelf for additional storage space. The design is sturdy and long lasting with its beautifully curved black iron frame. This rustic industrial coffee table features a solid acacia wood table top and bottom shelf and the wood is finished in a blend of natural acacia and 2-tone grey. Perfect for formal or casual living spaces. Within a compact space, choosing the right pieces of furniture is crucial in order to feel relaxed and comfortable. Maximize every square foot of your room with Bestar's Small Space units! Durable commercial grade top surface with melamine finish that resists scratches, stains and burns. 4 open compartments to keep you organized. Assembly Required. 40 Inch Riverbend Coffee Table Natural The Riverbend Coffee Table is the perfect addition to your contemporary styled living room. This piece features unique distressing, a simple square shape and double drawers for additional storage. Antique Brass Drawer handles create interest in the piece as well.